Why would you want to be our webmaster? Because this position is vital to communicating with members and partners across all of our activities, giving you many opportunities to be creative and help shape the direction of the VSO along the way. Our webmaster plays an important role in making us a welcoming organization and in driving our conservation accomplishments. Your main task is maintaining all existing information and updating the www.virginiabirds.org web domain, specific duties are described below. - Maintaining current information regarding VSO activities, officers, and chapters. - Uploading VSO publications to the website and ensuring that announcements regarding VSO field trips are posted in a timely fashion. - Though the webmaster is not a voting member of the VSO, he/she is expected to attend VSO board meetings on a quarterly basis (Feb, May, Aug and Nov). Board meetings are typically held in Charlottesville or Richmond, with the May membership meeting held in various parts of Virginia. - A detailed list of duties and activities related to the position is available upon request. Proficiency and access to Microsoft Word and Excel, Adobe Acrobat, Adobe Photoshop or other image editing software. Basic knowledge of HTML is a plus since some tables like the Official State List are written in this language and will need editing each year. The website interface is provided by Squarespace.com, and the webmaster is required to create a personal account here. Contact current webmaster Rob Bielawski robbielawski[at]gmail.com and VSO President Lenny Bankester at lennybankester[at]yahoo.com to express interest or ask questions. The box building/erecting phase of the Kestrel Project is nearing an end. Our goal of 400 boxes has been reached. Our total as of now stands at 455 boxes in 44 counties. There is enough wood left from the original white cedar purchase for another 25 or so. We do not plan any more truckload long distance trips, but might still put up some boxes here and there when feasible. We’ve been fortunate to enlist some eager and capable helpers in northern VA, and will be supplying them with more boxes. Our highest concentration of boxes is in Highland County, the Shenandoah Valley, and Piedmont counties just east of the Blue Ridge. 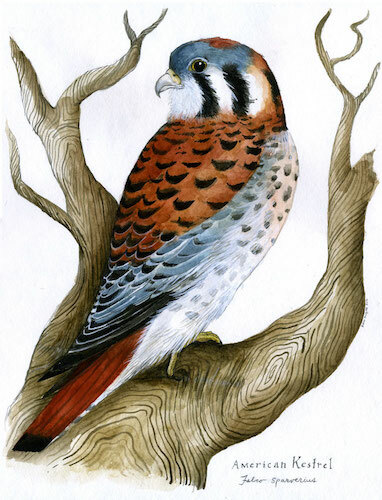 It’s been interesting to note the encroachment of development into traditional farming areas and the proliferation of vineyards all over the state, both bad news for kestrels. However, much good habitat remains. One very rewarding aspect of the project has been the interest and enthusiasm shown by rural folks, many of whom were unaware of what a kestrel is. We were hardly ever turned down for a box placement when knocking on doors. It’s been great to be able to promote the VSO and habitat preservation. We always ask hosts to report back to us any activity with their box, and not surprisingly, few do. But some folks do, and we hope more will. Some have reported starlings initially occupying their box, only to have kestrels the following year. 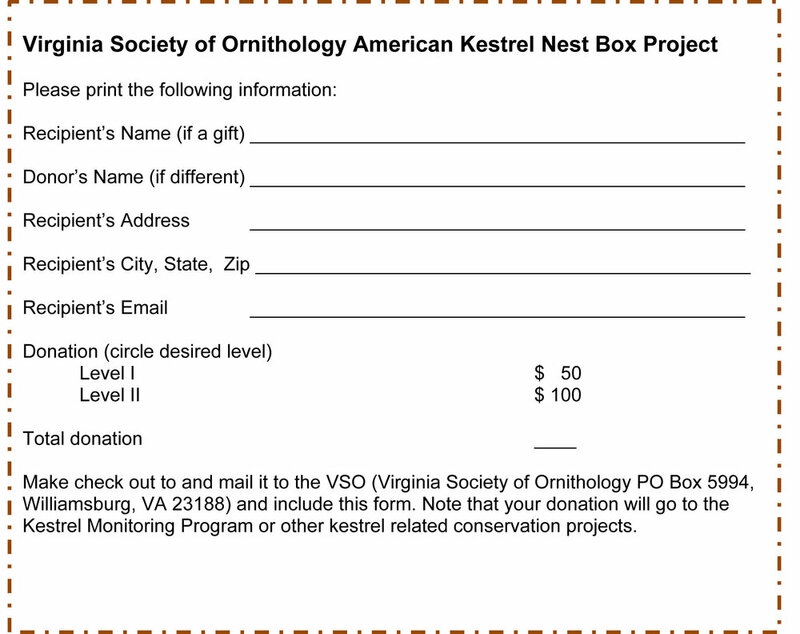 On Feb. 15th we celebrated placement of the 450th kestrel box at an organic vineyard (one of few in the Eastern US) in Albemarle County - see photos below..
Summary (as of late Feb., 2018): 455 boxes, in 44 counties. 317 erected by us, 138 given to others. The Kestrel “team” (l to r): Mary Ames, Doug Rogers, Dan Bieker, Patti Reum, David White; Photo courtesy Doug Rogers. State Parks: Powhatan, High Bridge, Sailor’s Creek, Sky Meadows, James River, Shenandoah River, Caledon, Lake Anna, Mason Neck, Belle Isle, Kiptopeke, York River, Chippokes, Middle Peninsula, New River. Locations of nest boxes scattered throughout Virginia's Blue Grass Valley! The 2017 monitoring season of Highland County American Kestrel Nesting Boxes started with the first monitoring round on April 16. The regions of Highland County are divided into parts, one consisting of the Blue Grass Valley (BGV) boxes which is the core story area of the Blue Grass Valley Monitoring Project, and the other consisting of the remaining boxes in the county which are not located in the Blue Grass Valley. There are 38 boxes in the BGV Study and 14 in the rest of the County. The boxes within the BGV study area are monitored more frequently at an interval of every 10 days or so, and they are cleaned out at the end of the season. Cleaning out the boxes and examining their contents can reveal much about what happened inside that box. By examining eggs that are non-viable and by analyzing the contents of the box and examining pellets inside the box, you can learn what prey the birds were eating, what remains are left in the box and possibly what happened to eggs that did not hatch. Also, we are providing next year’s box occupant with a cleaner box, removing dead debris and placing new wood chips in to prevent rolling eggs. Of the 38 boxes in the BGV study area, 15 of them (or about 39%) produced fledglings. I approximated by visual observation that these 15 boxes produced 56 birds, which is a low estimate. Without actually seeing the young birds after they fledged, it is impossible to come up with an accurate number, but this approximation yields about 3.7 birds per box. It is important to remember that number of birds fledged does not represent number of birds that survive and reproduce the following year. Here is a table of results for the remaining boxes, some of which were empty, some used by other species, and some predated. Some also just were abandoned or failed to produce eggs that hatched and one can only speculate in many instances as to why this occurred. Note that some categories overlap and therefore the total exceeds the number of boxes. The surprise, and a negative one at that, is the number of abandoned boxes after eggs were laid. I have no idea why this occurred and can only speculate. It is possible that the birds were harassed by starlings or some other predator, the adult(s) were killed, there were temperature extremes which may have affected successful hatching or some other reason. Four out of the 5 boxes were located within 6 miles of each other on the same road, and three of these boxes were successful last year, so perhaps some disturbance occurred along that road. It seems more than a coincidence that all of these boxes were inhabited, and then abandoned. Another interesting an unexplained event is that the breeding season ended about 2 weeks earlier than 2016. By mid June of 2017, there were no boxes with young kestrels. In 2016, I monitored into the first week of August. One reason for the change in dates of box occupancy could have been weather related, so I collected weather data from weather observers, both at high elevation and in the valley. * One box occupied by bluebirds later in season after used by starling. In February of 2017, over half of the days had temperatures in the fifties and sixties, quite a warm month. This may have caused the kestrels to claim the boxes earlier and perhaps lay eggs earlier. In March of 2017, there were over 6 days where the temperatures ranged in the low teens. In April, from April 1 to April14, the temperatures remained in the forties, with several days of below freezing temperatures and snow. This may have had an effect on incubation, especially if the male had to travel significant distances to obtain food to feed the incubating female. Clutch Initiation Date (CID) is exactly what the name implies: the date that the first egg is laid. All of my CIDs are estimates, but the earliest Clutch Initiation date this season was April 18 and the latest was May 30. This late date was most likely a second attempt to incubate, probably by the same pair, after starlings took over the box after AMKE eggs were laid. The majority of clutches were initiated from around April 14 until around April 24. One note of interest is that a female banded in the winter of 2016 occupied and successfully nested in a box less than one quarter mile from where she was banded. I conclude this female is non-migratory. In conclusion, the occupancy rate is high for the Blue Grass Valley study area, although slightly down from the 2016 season. The area outside the valley also had more AMKE occupied boxes. Of interest are the number of boxes that were either abandoned or predated this season. This was the first season that detailed records were kept with regular monitoring intervals. It will be interesting to see what occurs in the 2018 breeding season, the second year of this project. Next season, we will look for possible causes for why boxes were abandoned or predated. We will keep detailed records of observation of all boxes in 2018.